This is the first UK printing of WILDLIFE AND WILDERNESS. AN ARTIST'S WORLD by Keith Shackleton. It was published in London by Clive Holloway Books in 1986. The book measures 243mm tall x 291mm, and has 120 pages, 49 color paintings, & 5 b/w in-text drawings. This is a selection of the artist's paintings with a full-page commentary by him on each painting. There is an initial chapter of the author's comments and ideas about painting. 25 of the paintings relate to Antarctica or far southern ocean scenes. 3 are of mountain scenes. 12 are of ocean birds, fish, and aquatic mammals. 9 are related to the Arctic. CONDITION: Original navy covers & spine, gilt lettering spine. 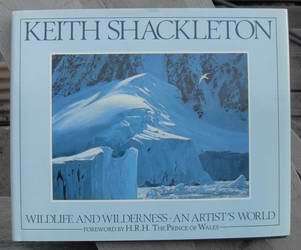 SIGNED by Keith Shackleton on the title page. nice DJ(no chips, no tears, clean), tip of lower rear outside corner bumped, otherwise Fine with no previous owner marks or writing on any pages. Price: $50.